Burry Port (Welsh: Porth Tywyn) is a small town five miles (8 km) outside the larger centre of Llanelli in Carmarthenshire, Wales, lying on the Loughor estuary (Moryd Llwchwr).The town's population was 4,209 in the 2001 census and 4,240 in 2012. The town is home to a harbour and is where Amelia Earhart landed as the first woman to fly across the Atlantic Ocean. The Pembrey Burrows sand dune and wetland system, home to a country park and the Cefn Sidan sands, lie nearby. The town also has a proud musical heritage and is also home to Burry Port Opera, Male Choir and Burry Port Town Band. People made a living in Burry Port from farming and fishing before the industrial revolution brought the railways and collieries to the area. As Pembrey Burrows was a hazard to shipping, local people would also salvage what they could from boats wrecked in storms while navigating the Bristol Channel. Pembrey sands have proved the final resting place of many ships, some by mishap, others it is said lured to their doom deliberately to provide plunder for the wreckers known as "Gwyr-y-Bwelli Bach" or "The Men of Little Hatchets". They were named after the locally made tool, a hatchet incorporating a claw for ripping open cargo and equally useful for dispatching unwanted witnesses to the wreckers' activities . Records indicate that coal mining was established in the valley as early as 1540 although there was little effective transport. The Gwendraeth Fawr at the time was navigable but treacherous. Growing interest in coal, limestone and iron ore drove the growth of the coal trade. Thomas Kymer, owner of many mining and other operations in the area established several loading places and primitive trackways to load barges on the Gwendraeth Fawr. Cargo was carried down the Gwendraeth river and then up the Towy to Carmarthen. In 1768 Kymer opened a canal and quay, part of which is today restored and preserved. The canal cut through the marshes allowing boats to travel upstream far enough to reach solid ground where quays could be built. This allowed barges to operate at all times and without having to wait for tides to get inland. A canal alone was not sufficient to solve the transport problems and wagonways were built to carry traffic from the mines to the canal itself. Several of these wagonways became plateways and then railways as technology improved. A second canal was cut by the Earl of Ashburnham in 1798 to serve his mines nearby and this also was fed by wagonways. The canals continued to expand and wharves and dock facilities were built. More mines continued to open further up the valley sending their coal down through the canals to the sea. The trade in coal was hindered heavily however as the shifting sands made the river treacherous and the safe paths changed year by year. In 1832 a harbour was built at Burry Port, a few years after the nearby harbour at Pembrey opened. Fed by a series of chaotic canals and wagonways it finally offered a way to ship Gwendraeth coal out by sea. No village or town of Burry Port yet existed. By 1840 the canals feeding Burry Port and their tramways fed coal from the entire Gwendraeth valley down to the sea. Early records of Burry Port as a town appear around 1850, springing up around the new docks adjacent to Pembrey. The importance of the newly emerging town was plain when the railways reached Burry Port, and the station serving both Pembrey and the new town of Burry Port was built a few hundred yards down from Pembrey at Burry Port. The canal network was now unable to handle the loads from the Gwendraeth valley mines and part of the canal network was converted into the Burry Port and Gwendraeth Valley Railway by the late 1860s with the port continuing to grow in importance and shipping volumes. Carmarthen Bay Power Station was built on the north shore of the Burry Estuary, occupying some 220 acres. Work started on its construction in April 1947, power was first generated on 28 June 1953. At this time the plant employed around 500 people and during its 31 years of operation the three stacks became a local landmark. The power station ceased generating power in 1984, and was demolished in the early 1990s. With the closure of all the mines at Cwm Mawr the railways up the valley were lifted. The harbour is now a marina for small leisure craft. Pembrey and Burry Port railway station still exists and is served by regular services east via Swansea and Cardiff to London and west into Pembrokeshire. Burry Port boasts a small supermarket, specialist shops, several hairdressers, a beauty and skincare salon, an array of pubs and fast food outlets, a library and a large secondary school. Glan-y-Mor Comprehensive School (Glan-y-Mor translates as 'Sea-Shore') has about 600 pupils. There is also a Welsh primary School - Ysgol Parc y Tywyn, and an English medium infants school and an English medium junior school in the town. Burry Port lies on the Millennium Coastal Path from Bynea near Llanelli to Pembrey Burrows. The town is also home to a lifeboat station which is situated in Burry Port Harbour. 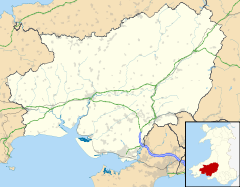 Burry Port lies in the Llanelli parliamentary constituency, which has been held by the Labour Party since 1922. The Labour Party has also largely controlled the local government representation although this has been challenged in recent years by Plaid Cymru. Amelia Earhart Landing in Burry Port. On 17 June 1928 Amelia Earhart flew from Newfoundland with co-pilots Wilmer "Bill" Stultz and Louis "Slim" Gordon in a Fokker F7 and on 18 June landed safely in Burry Port, becoming the first woman to fly across the Atlantic. An Amelia Earhart festival was held in June 2003 to celebrate the 75th anniversary of the landing, and the event is commemorated by engraved flagstones and a plaque in the harbour. The Millennium Coastal Path near Burry Port. Road - Burry Port is connected to Llanelli and Carmarthen by the A484 road. Bus/Coach - There are regular local buses running through Burry Port, linking the town with Carmarthen, Llanelli and Swansea with a main stop across the railway bridge from the Co-operative store. Evening and Sunday services were, however, withdrawn in July 2014. Rail - Pembrey & Burry Port railway station is on the West Wales Line. Westbound services from Burry Port terminate at Carmarthen or Pembroke Dock, with less frequent direct services to Fishguard and Milford Haven. Eastbound services terminate at Swansea, or run through to Manchester via Cardiff with less frequent direct services to London Paddington. Train services operate seven days a week including evenings. Walking and cycling - Burry Port is connected to The Millennium Coastal Park which includes a 22 km pedestrian walkway and cycleway along the south coast of Carmarthenshire, providing a link between Bynea, Llanelli and Pembrey Country Park. The Millennium Coastal Path cycleway forms a section of both the Celtic Trail cycle route (part of NCR 47) and the National Cycle Network NCR 4. Air - Pembrey Airport is a commercial Airfield for private and charter flights. It is a few miles west of Burry Port. The nearest regional airport with domestic and scheduled flights is Cardiff Airport. ^ "Amelia Earhart Festival". Retrieved 2009-08-20. Wikivoyage has a travel guide for Burry Port.